What is a Spork? I must admit I was totally in the dark. Maybe I don’t get out enough, but for those of you who are as blissfully uninformed as I am, a Spork is an amalgamation of a spoon and a fork, and it allows you to pierce food and scoop food in one easy stroke. The Spork – I am told – is a utensil that originated at the Kentucky Fried Chicken restaurant chain. I’ve never eaten at a KFC. Yet, this is about to change, as I descend on San Francisco, along with a small army of colleagues from around the world for a two-day conference. Jet lagged and undernourished (because nothing resembling food is ever served on planes), we arrive famished in the City by the Bay, and our genial host, who I’ll call Papa Bear, immediately sends us to Spork to fill our stomachs and revive our spirits. In San Francisco, a vacant building is a good enough reason to start a new restaurant, and Spork – located at 1058 Valencia Street – is the site of a former Kentucky Fried Chicken, now revamped and remade and devoted to classic American dishes made with fresh ingredients. While you might think you can almost hear the chickens clucking, no poultry is actually served on the premises. Allyson the Savage and Pamela the Rock are our designated food photographers for the evening since they actually remembered to bring cameras (unlike your intrepid Culinary Types editor – shame on me). While I usually work alone, it’s kind of nice to have a team of food paparazzi. It gives me more time to eat. The photos presented here are their fine work. 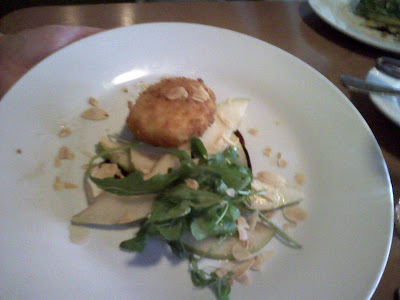 Tera and I, who may be destined to sit together wherever we go, each choose Goat Cheese Croquette with Pears as first course and Seared Dayboat Scallops with farro salad, beet puree, horseradish cream, arugula and orange vinaigrette. 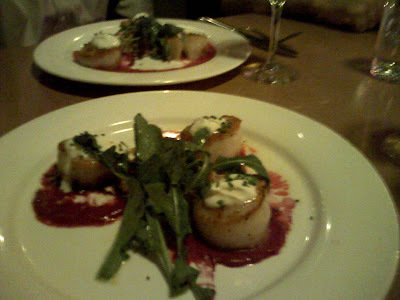 The scallops are melt-in-your-mouth delicious, and my culinary twin Tera describes the goat cheese croquettes as “Crispy goodness with melty cheese on the inside.” She does note that the single croquette is “lonely.” One croquette per person is just wrong. We are hardly discriminating when it comes to dessert. We order one of everything on the menu and share. Buenos Aires Gus is smitten with the Strawberry and Huckleberry Cobbler, topped with vanilla ice cream, and yours truly is all but lusting after Donut Power, the light and fluffy beignets with cinnamon sugar. I also do a number on the Rocky Road Ice Cream. You heard it heard it here first, gang. Have your spork ready. An apparent forerunner of the spork is the "runcible spoon" or "ice cream spoon" referred to in Edward Lear's 1871 poem "The Owl and the Pussycat." that's an awesome name for a restaurant! and they actually had the silverware to back it up. was the food good and would you recommend? I bought a package of bamboo sporks at a kitchen supply store in NYC a few months ago, and adorable though they are, they haven't yet found a practical role in my kitchen. Hope you enjoy the rest of your explorations in SF! No KFC? Ever? Well, it's too late now. And here I thought sporks came from Taco Bell. The Seared Dayboat Scallops on the sample menu also sound pretty good. I don't eat at KFC either. I never heard of the restaurant you went too. 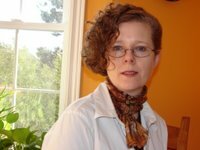 I just blogged a few days ago about people preference to using a spoon or fork when eating and my last remark was about using a spork, how funny; they were around many years in the south where KFC was very popular, but only made from plastic and pierced your tongue if you were not careful. Confession #1-I have never eaten @ KFC ever! Confession #2-I changed all my Fork Cookie recipes to Spork cookie recipes long ago when researching Cork Screws & Runcibile Spoons...really I did. 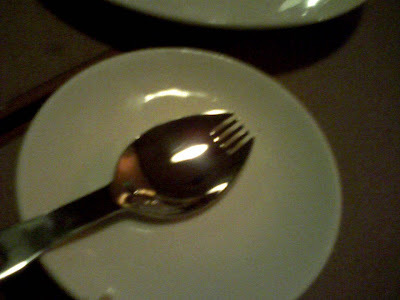 Spork: Patented in 1907 "This invention relates to utensils for table use; and its object is to provide a combined knife, spoon, and fork all formed in a single piece and any of which can be conveniently utilized..."
It is said the spork was extensively used during WWII and sometimes included in C-Rations during the Vietnam War. As for the pie (with ice cream of course) thing, Pie & Spork sounds like and up and coming name. Don't you think? And Spork is also a delightful 1940s Spam imitator! I have a Spork cookbook with many lovely recipes, including Spork Chops and Spork Croquettes. I like the KFC in the Philippines. For some reason the ones over here are unappetizing. 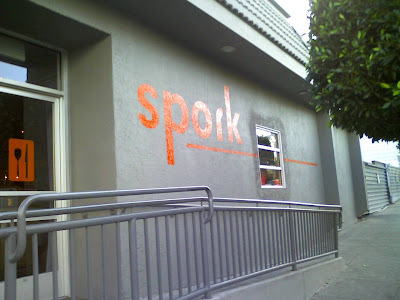 Spork - What a cute name for a restaurant. Fr. - I've always wondered if a runcible spoon was as effective as the JFK spoon? 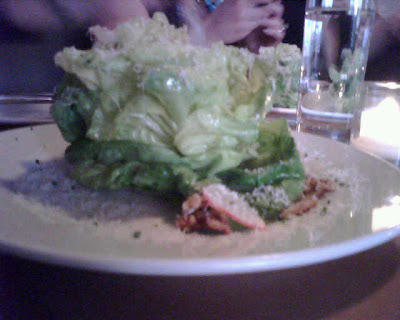 Paoix - it's very tasty, and they change the menu frequently. Worth a trip back. Lydia - A full package? Sounds like you should host a Spork party! Kalyn - never been in the restaurant, although I may have have eaten it once. Helene - You should try Spork if you're ever in San Francisco. Chef E - You can actually buy a brank new aluminum spork right off the menu! Lidian - Spork and Spam - it's almost poetical! 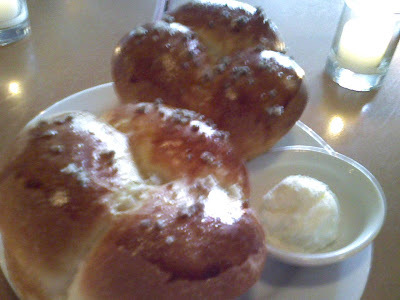 Hi Veron - Keep an eye on those rolls - they go quickly! This was a truly wonderful night. I have to say nothing's more liberating than ordering "one of each" from the dessert menu!